This document describes how to setup ECMP over OSPF on Check Point Gaia OS. This document focuses on the basic configuration of ECMP over OSPF and does not discuss ECMP or OSPF features in details - refer to sk95968 - OSPF on Gaia. Before starting the ECMP over OSPF configuration, user should be familiar with underlying features and their configurations such as static and dynamic routing, ClusterXL, VRRP, SAM configuration. It is assumed that user has basic knowledge of ECMP and routing in general and OSPF in particular. Nexthops are selected based on weighted fair queuing. Once the next hop is selected it stays the same as long as entry is in the route cache. Once the entry is deleted from route cache nexthop can change when queried for destination next time. Check Point's OSPF routing suite supports up to eight simultaneous routes, which means that up to eight OSPF routes can be used for ECMP. If the routing metric calculations discover more than eight paths of equal cost to the same destination, the ECMP feature makes available only the first eight. One of the issues, with which Network Administrators have to deal, is asymmetric routing through the firewalls. Problems occur when an outbound packet goes through one interface of the firewall, but the return packet is received on a different interface of the firewall. Typically, firewalls have Anti-Spoofing drop policy on interfaces, which will drop such asymmetric packets. 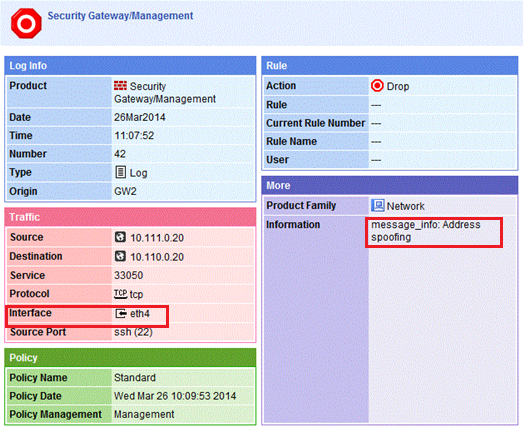 To solve this problem on Check Point Security Gateway, administrators can change the interface policy in the SmartDashboard in Security Gateway's object: add Destination networks to the "Specific Group of networks behind interface" for all interfaces, on which the traffic of interest is expected. Alternately, you can allow asymmetric packets by setting the Anti-Spoofing to detecting them, or by disabling Anti-Spoofing completely. The Security Gateway must be fully configured (including all the relevant Software Blades). Policy must be installed on Security Gateway (and allow the relevant traffic to pass between the involved networks). Basic routing should be working as expected. OSPF must be configured (refer to sk95968), and OSPF neighborships should be established. In ClusterXL, OSPF state is present on the Standby member. 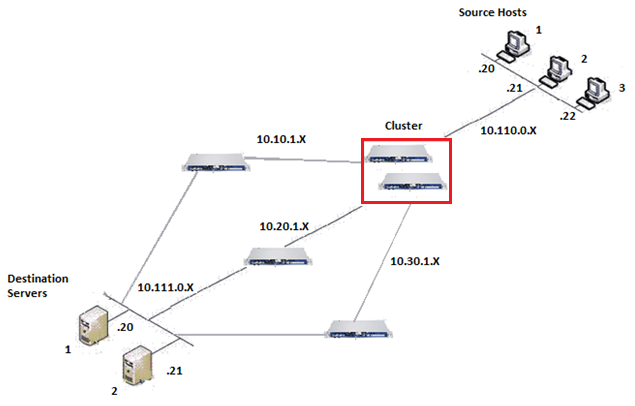 In ClusterXL, use cluster Virtual IP addresses and set "virtual address" on OSPF interfaces. 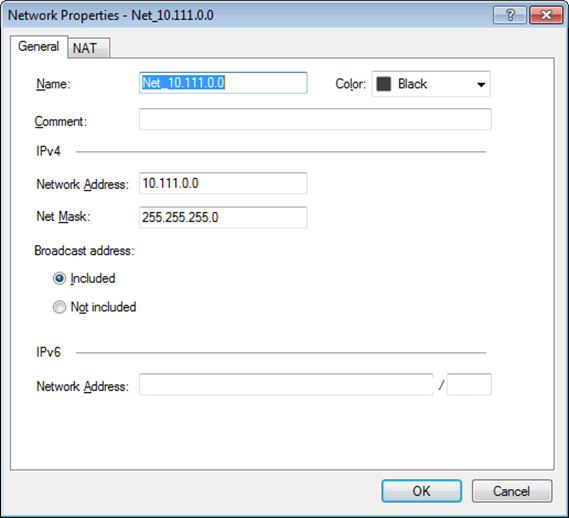 In VRRP cluster, you can use either cluster Virtual IP addresses, or physical IP addresses on OSPF interfaces. ECMP for OSPF is enabled by default, and default number of maximum paths is set to 8 (eight). To disable ECMP for OSPF, set the number of maximum paths to 1 (one). 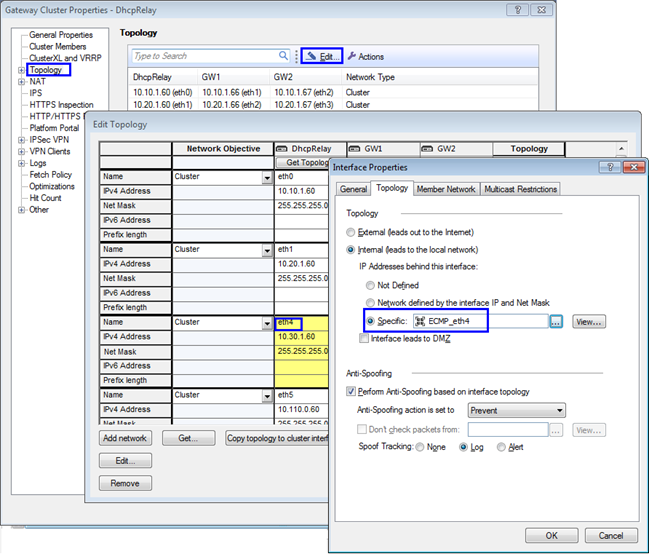 In the tree view, go to 'Advanced Routing' pane - click on 'Routing Options'. 'Maximum Paths' specifies the maximum number of equal-cost paths to use (range: 1-8; default: 8) when multiple such paths to a destination are available. Only OSPF, BGP, and static routes are able to use paths/routes with more than one "nexthop". 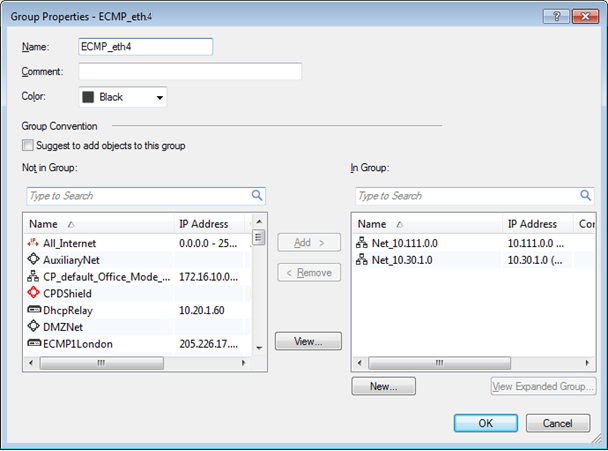 To disable ECMP, set the number of paths to 1 (one). Changing this value will result in re-installing all the routes. Connect to command line on Security Gateway / each cluster member (over SSH, or console). 'Maximum Path Splits' specifies the maximum number of equal-cost paths to use (range: 1-8; default: 8) when multiple such paths to a destination are available. ECMP can cause traffic to flow asymmetrically. That is, traffic to destination may leave the Security Gateway from one interface and traffic from destination may arrive on some other interface. Such traffic will be dropped by Security Gateway due to default Anti-Spoofing settings. To allow the Security Gateway to receive traffic of interest on expected interfaces, destination networks of traffic of interest must be included in group of networks behind the interface, and this specific group must be applied to the interface in Security Gateway / Cluster object. Create Network object for each relevant network. Create Group object for Internal networks and Group object for External networks and add the relevant Network objects to each of the Group objects. Apply the Group object (that contain the relevant Internal networks) to the Internal interfaces in Security Gateway / Cluster object. SmartDashboard - Security Gateway / Cluster object properties - 'Topology' pane - click on 'Edit...' - edit the Internal Interface (in our example - eth4) - go to 'Topology' tab - select 'Specific' - select the Group object that represents the networks behind this interface - click on 'OK'. Apply the Group object (that contain the relevant External networks) to the External interfaces in Security Gateway / Cluster object. SmartDashboard - Security Gateway / Cluster object properties - 'Topology' pane - click on 'Edit...' - edit the External Interface (in our example - eth2) - go to 'Topology' tab - check the box 'Perform Anti-Spoofing...' - check the box 'Don't check packets from' - select the Group object that represents the networks behind this interface - click on 'OK'. Click 'OK' to apply the changes and close the Security Gateway / Cluster object. Create security rule(s) to allow the relevant traffic to pass between the involved networks. Install the policy on the Security Gateway / Cluster. "Round robin" next hop algorithm is not supported. "Source hash" next hop algorithm is not supported. "Destination hash" next hop algorithm is not supported. ECMP over OSPF supports up to 8 simultaneous routes. Verify that multiple routes for equal-cost paths to the destination are correctly shown on Security Gateway / ClusterXL Active member / VRRP Master cluster member. Note: In cluster, OSPF state will not be present on the ClusterXL Standby / VRRP Backup member. Verify that the traffic is routed according to ECMP configuration and routing table. Capture the traffic using the FW Monitor (for syntax, refer to sk30583 - What is FW Monitor?). Check logs in SmartView Tracker. 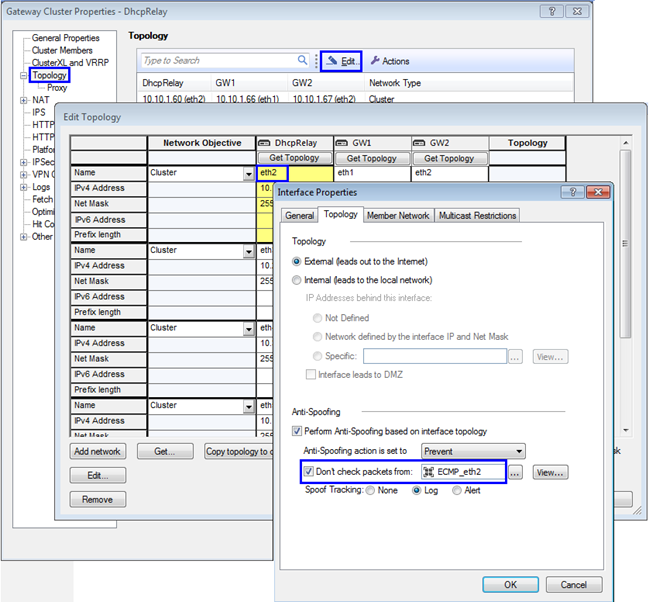 Capture the traffic on Security Gateway (on the involved multipath interfaces) and on the Source Host / Destination Host.